Bag - a very useful thing, becauseIt can store all Household appliances:.. decoration, thread, needles, buttons, keys, business cards, etc. Probably, such a product is in every house. A beautifully styled casket is also able to successfully emphasize the style of a room, living room or bedroom, and become an integral part of the interior. 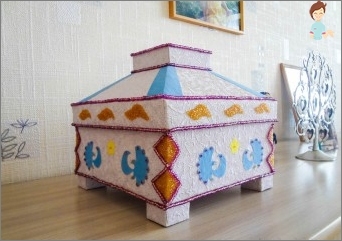 Personally decorated casket willa perfect gift for a friend, colleague or family for a birthday or a wedding, and the decorating process itself can later turn into an exciting hobby. It is also worth noting that a great passionIt develops imagination, memory, and has a positive effect on the nervous system. If your home has an old wooden box, which has long lost its appeal, do not rush to send it in the trash, because the stylish thing to decorate your own hands can even man, has never before engaged in decoration. 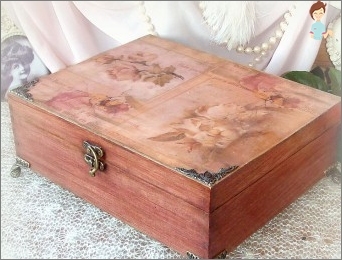 Before you begin decorating a woodenboxes, it should prepare for it. Thus, if the walls are outside the paint residues, varnishes, adhesives or inks, clean them, to a material surface is as flat and smooth. If the surface is too smooth, it can be sanded. The outer surface should bedegrease to applied new material is firmly held. This can be done by wiping the casket cloth soaked in alcohol or vodka. Then allow to dry for 10-12 hours the product or dry the hair dryer. There are plenty of optionsjewelry boxes. We offer for your consideration of the most popular and interesting of them, and you can already their complement, modify, guided by own imagination. Of course, the first attempt to create a brilliant masterpiece with his own hands you are unlikely to succeed, because this kind of art requires skill and certain skills. But if you try, the result is sure to impress not only you, but close. To begin to prepare the sketch. The simple pattern is, the easier it will be to apply the paint. You can come up with something on their own, and can search the Internet interesting pictures or books. First we apply our sketch on a sheet of paper,focusing on the size of the box. For the convenience of repeating elements can be cut out of solid paper and then applying them to the walls and lid of the product. The smoother the surface is carefully processedprimer for acrylic paints and give to dry thoroughly. Then proceed directly to the painting. First, cover the surface of the casket basis, dried it, and only then put on her drawing with the help of templates. Now, very gently, using a special thin brushes, color the picture. If you work, you suddenly make a mistake (and it happens even to the professionals), do not worry. Acrylic paints have a coating effect, so over the blots can apply a new coat of paint required, without prejudice to the pattern. Council. If you doubt their abilities, before you put in the box pattern, practice on another surface - such as a piece of paper. Ready painted box should be thoroughly dry. When the results are impressed and want to make a long-lasting decoration, it can lacquered furniture. Kanzashi (or Kanzashi) - is the Japanese arthair ornaments. It is based on the ability to add ribbons, fabric flower petals pieces and stick them to the ground. 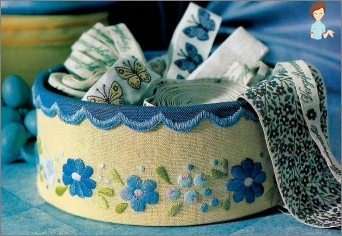 Today kanzashi technique is used all over the world for interior decoration elements, decorative pillows, curtain, women's handbags, as well as boxes. 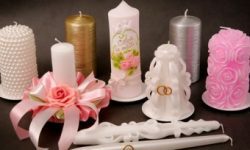 Ribbons can be decorated not only wood but also the box of any other material -.. Plastic, glass, clay, etc. 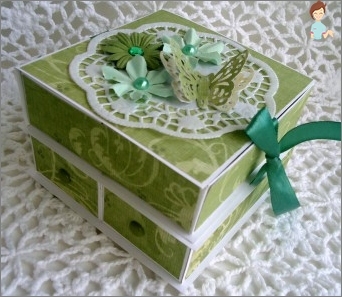 Boxes decorated kanzashi, looks very rich, impressive and elegant. jewelry (beads, rhinestones, beautiful buttons, beads and so on. d.). The first step is to paste over the box - the very foundation of crafts - cloth or ribbons. For this abundantly lubricate the workpiece glue and glue tissue. So far, the foundation dries, proceed to the workpiecedecorations. It can produce not only the color from the ribbons and fabric pieces, but the petals, miniature fruit and so on. e. they can decorate as you like, using beads, buttons or rhinestones. Larger articles made of strips should be glued on the cap, and small - on the side of the casket. 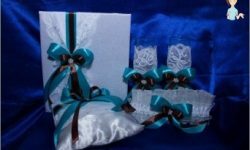 It is worth noting that the best way to decorate a boxribbons made of expensive fabrics - satin, velvet, silk, as these materials look more elegant and rich. But to buy lengths of cloth for this purpose is not particularly worth it - you can use scraps remaining after garments, curtains or drapes. 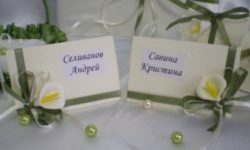 If you want to decorate a box to the wedding (formoney or rings), you can use the following idea. Housing obkleyte white or ivory satin, and cover decorate pink lilies or roses and white or pale green ribbons. To decorate the boxes to the wedding alsoit is recommended to use river or saltwater pearls, as these stones are not only perfectly suited for this celebration, but also a powerful symbol of fidelity, light, wealth and health. Probably resting at the seaside, yourepeatedly met with traders offering various souvenirs made of natural materials. Among these artefacts are usually always present beautiful casket, decorated with seashells. Few of us ever occur to you that such a present, you can easily make yourself, not tumbling with fabulous money southern craftsmen. Decorate with seashells can not onlywood, and cardboard casket or a casket. First sort out the shells and think carefully about the idea of ​​decoration. In planning it, be sure to leave a part of the shell of a certain size and color in reserve, because during operation, they can be damaged. Crush of the shell (you can use damaged) into crumbs. Generously grease the entire outer surface of the workpiece glue and sprinkle it with crumbs of shells. Allow the glue to dry thoroughly, then chickened residues. If necessary, the procedure can be repeated. Now we proceed to substantive work. 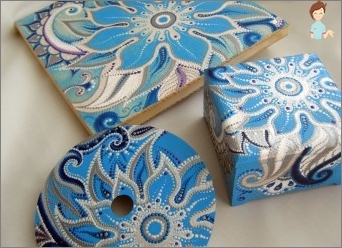 First of all, you need to decorate the cover of the box, as it is the main element. You can fantasize as you want soul. You can, for example, put on the lid of a large lily of the large inverted shells, geometric shapes, or, if the surface area allows a symbolic inscription. Once the lid proceed to the walls. To attach the shells do not regret the glue, otherwise the hack could crumble after the final drying. After putting some pattern gently lubricate souvenir varnish and dry it in a dry place, protected from direct sunlight, place. As you can see, to decorate the casket for yourself or for a gift is a snap. The main thing - do it with love and in a good mood!